My interest in healthcare began when I was young. I grew up hanging out at my parents' pharmacy, Hutchinson Drug Store, which was located in downtown Lexington. As I got older, I worked in the store first as a "soda jerk" and later as a pharmacy technician. Our pharmacy was started in 1926 by my grandfather and we still sold many old time remedies, so I developed an appreciation of the history of medicine and a fascination with health care systems. As my family has always had an affection for and devotion to the downtown area and community, it was only natural that I wanted to open an acupuncture office in downtown Lexington. 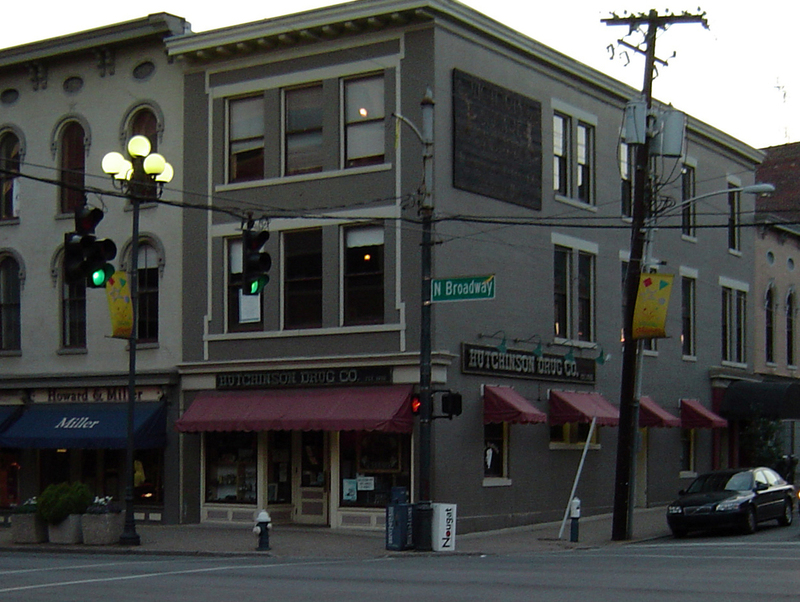 Hutchinson Drug Store (circa 2007) was located at the corner of Short & Broadway. Interior view of Hutchinson Drug Store at the Short & Broadway location (circa 2007). My journey to become an acupuncturist started with anthropology. As an undergraduate at Vanderbilt University, I decided to major in anthropology after I had my first course in medical anthropology. I later went on to graduate school in the doctoral program at the Department of Anthropology at the University at Buffalo (SUNY) . My initial intent was to study the cultural aspects of medicine in China, but I felt that there is only so much one can understand about acupuncture from just reading books. So, long story short, in 1999 I enrolled in a 3-year Masters level program at the Maryland Institute of Traditional Chinese Medicine (MITCM) in Bethesda, MD. During my time as a student at MITCM, I had a chance to study in China at a summer acupuncture course at the Shanghai University of Traditional Chinese Medicine, which included clinical observation at Longhua Hospital and Ruijin Hospital. In 2002 I completed my acupuncture training, including a year of Chinese herbal medicine training. After passing the national boards, I returned to Buffalo to finish my doctoral work, which had evolved into studying the transnational flow of Chinese Medicine. I spent over 8 months observing acupuncture training and interviewing students and faculty at the European Institute of Oriental Medicine in Munich, Germany for my field work. While writing my dissertation, I taught both undergraduate and graduate courses in the Department of Anthropology at the University at Buffalo. Taking time off from acupuncture training to tour the Forbidden City, Beijing, China (2001). After completing my PhD, I returned to Lexington and started a 2-year, post-doctoral fellowship in patient safety from the National Center for Patient Safety at the Lexington VA Medical Center site (Cooper Division). In addition to my research project focusing on the culture of safety and teamwork in an Emergency Department, Hemodialysis Unit, and Surgical Service, I received training in high fidelity healthcare simulation, Green Belt certification in LEAN healthcare, participated in multiple Root Cause Analyses, and conducted a Root Cause Analysis at the team leader. After the fellowship ended, I maintained an research affiliation with the Lexington VAMC to I finish data analysis as a Research Assistant to Katherine McKinney, MD, MS.
During the second year of my VA fellowship, I was offered a chance to be a co-preceptor for first-year medical students in the course Introduction to Clinical Medicine I (ICM1) at the University of Kentucky College of Medicine, Medical Behavioral Science Department. I have spent three years as a behavioral science preceptor for the ICM1 teaching with clinical preceptor Angela Webb, MD. Additionally, I frequently offer small group seminars about acupuncture for first-year medical students. Currently, I am working with the ICM1 course directors to provide opportunities for medical students to learn more about acupuncture and alternative medicine through observations at my office.